My technology colleagues will agree, nearly 100% of us are self taught. 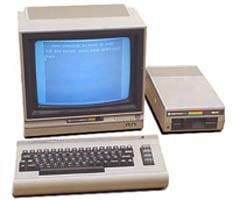 In 1981 at age 12, my parents purchased my 1st computer which was a Commodore 64 that had 64,000 bytes of RAM compared to computers now which come with a minimum of 2 GB (2 billion bytes) of RAM. I learned how to program in BASIC on that Commodore 64 by reading the guide that came with the computer. After learning how to write conditional commands and loop commands in BASIC, I wrote a text based game which allowed the user to go on a “Dungeon and Dragons-like adventure”. In the 1990s while in college, I had an idea of creating a web site which would allow college students and anyone seeking a job to post their resumes online. Simultaneously, this web site would allow employers the ability to find employees. The idea was called Resunet (Resumes On the Internet). I had no idea of how to reserve a domain name let alone build an enterprise level web based application like this. Well, someone out there did know and in 1999 Monster.com was formed and the rest is history. Also, in the 1990s my fraternity brother (we called him DP) was just beginning medical school. I approached DP with an idea. I wanted to take all of the practical knowledge that he was learning in medical school and build a web site that would use a simple algorithm to diagnose patient ailments. We would call the web site DrDP.com. Due to my lack of serious web knowledge, we never completed this project. A few years later WebMD was created and again the rest is history. Before graduating from Michigan State University with a degree in Computer Science, I had one of my 1st opportunities to practice my "web craft". I was a lab assistant for Dr. Herman Hughes in the MSU High Speed Networking Laboratory. Using HTML, Perl and CGI, I created a content managed system (CMS) web site for Dr. Hughes before the term "CMS" had been used. After my years of web development experience and my years of work experience with companies like Yahoo! and Netscape, I am in a unique position to assist the next generation of web entrepreneurs. What if a young person desired to build an application that ran on the iPhone and used Yahoo! Maps, used proximity detection technology such as Yahoo! FireEagle and other technologies to develop something that has never been seen or tried before? Where would this young person even begin? Well, The Web Academy is designed to solve this sort of problem with basic web development classes, advanced server side scripting classes, advanced database management classes and advanced application programming interface classes. The Web Academy will teach our students how to stay current with technology and how to be self reliant to intellectually sustain themselves once they have out grown us. The Web Academy will be a simple door. The student has to walk through it. With all of the talented young people in our communities I am hopeful that the big technology success story of the next decade will begin with a 22 year old talking about his/her experience as a 12 year old with The Web Academy. Dude, I loved that Commodore 64! Too much actually. Because of it, I lost much sleep and missed many classes! p.s. Love the blog. Any lessons on putting mp3s or video content on websites coming soon? You were playing games on the C64. Not a good idea to miss classes playing video games. My first time visiting your blog. It seems you were a BDPA member back in the day. Have you reached out to the BDPA New York chapter yet? Anyhow, I enjoyed your back-story and I look forward to learning more about the web academy. Thanks for sharing post regarding Motivation behind The Web Academy. Either way, it looks like we’ll see multiple devices from both Apple and Samsung and that kind of choice is going to be great for those looking to buy this fall.